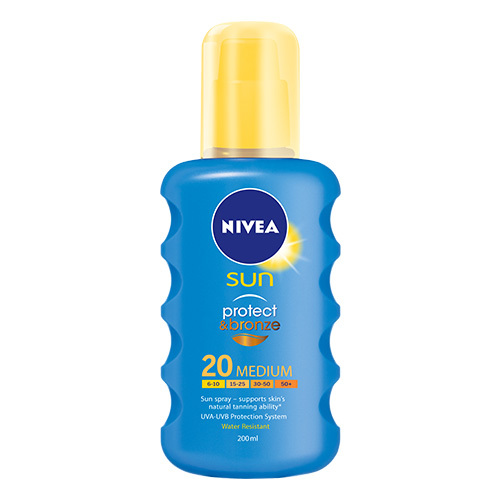 NIVEA SUN Protect & Bronze spray combines reliable protection and a natural looking tan. Immediate sun protection that gives you a natural, even tan. Protection or tan? Have both! How to use: - Shake well before use - Apply before sun exposure enough to give a visible layer rubbing in, let it dry then repeat to ensure adequate coverage - Reapply frequently especially after swimming and towelling - Do not spray onto the face - Even when protected avoid intensive midday sun (11am-3pm) and prolonged sun exposure - Keep babies and young children out of direct sunlight - Wear protective clothing and use sufficient sunscreen for unprotected areas - Avoid direct contact with fabrics and hard surfaces to prevent staining. Full Size: 200ml Price: Php 599 Available at: All Watsons Branches Social Media: Website: www.nivea.ph Facebook: www.facebook.com/NIVEAPhilippines www.facebook.com/NIVEAFORMENPH Twitter: @NIVEAPhils and @NIVEAFORMENPH Instagram: @NIVEAPHIL Be tanned and protected by grabbing this at Sample Room!